Memorial stone of Jarrett Lee Lane on 4/16/08. 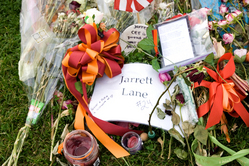 Items left at the memorial plaque of Jarrett Lane on the drillfield. Photo taken on 5-1-07. Friends and loved ones have placed several items by Jarrett Lee Lane&#39;s Hokie Stone. President Bush speaking at Tuesday&#39;s convocation, as witnessed from the 30 yard line at Lane Stadium.